Nathan Philips Square, August 27 2011. Photo by author. 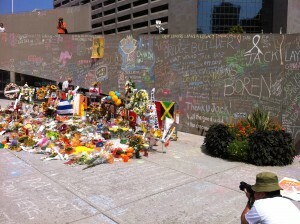 The passing of Jack Layton has unleashed a tremendous amount of mourning across the country. Saturday’s state funeral, usually reserved for current or former prime ministers, Cabinet ministers, and governors general, attracted thousands of attendees inside and outside of downtown Toronto’s Roy Thompson Hall. Many more people gathered at events held this past week across Canada to remember the man. 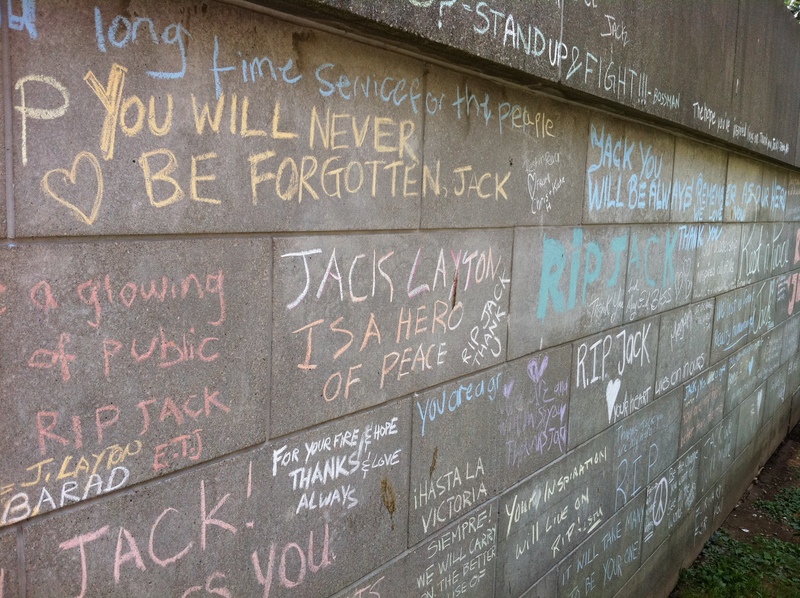 Possibly the most dramatic act was the striking facelift of Toronto City Hall, where people etched their thoughts about Jack in coloured chalk on the concrete of Nathan Philips Square. Mourning is about memory. And memory is not just about the past, but also aspirations for the future. Canadians responded to Layton’s death in diverse ways, from skepticism of its media coverage to participation in his funeral. The contribution Layton made to public life didn’t end as the crowds dispersed on Saturday. In fact, the memory of his life promises to influence Canadian politics and society in upcoming years. A day after Layton’s death, the National Post published a controversial piece by Christie Blatchford. The columnist questioned the public’s reaction and claimed that Layton used his own death for political reasons. In particular, Blatchford wondered why Layton, wife and fellow MP Olivia Chow, and other prominent NDPers had crafted his last letter to Canadians in the days before his death. No doubt Blatchford is correct that Layton and his close advisors had attempted to construct a historical memory in order to further the political goals for which he fought during his life. Journalist and activist Gerald Kaplan predicted that the letter “will find its way into history books for decades to come – a sense of what Canada could be at its very best.” In life and in death, Layton was a consummate politician, and it isn’t surprising that he spent his last days thinking about his legacy and the future of Canada. Layton’s death is unique in Canadian history, but shares similarities to other icons. He was the first Leader of the Official Opposition to die in office since Laurier. More important, his struggle with cancer touched millions: perseverance through physical pain played a part in his tremendous growth in popularity and the NDP’s jump in the polls. His cane, after all, emerged as the lasting symbol of the spring 2011 election. Commentators have compared him to Terry Fox, another Canadian who died of cancer just after achieving national fame for something many thought was unthinkable. 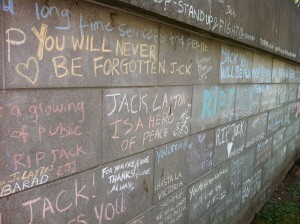 "You will never be forgotten Jack." Photo by author. The mass outpouring of mourning is linked to his recent political success. He even claimed he was the next prime minister in waiting, which had some truth to it. In this sense, his death is reminiscent of John Kennedy and especially his brother Robert Kennedy, politicians who died too young and before the apex of their political ascendancy. Layton’s death has created a power vacuum in Ottawa, as the NDP and the Liberals are now led by interim leaders. And although Stephen Harper has promised to listen to other parties, his majority government will rule during the next four years with a weakened opposition. As the left regroups, however, it will be interesting to see how politicians and other Canadians use the memory of Jack Layton. After John Kennedy’s death, President Lyndon Johnson invoked his predecessor to urge passage of the landmark US Civil Rights Act. The political circumstances are very different today than 1960s America, and the odds are against Layton’s death serving as the spark to ignite a new progressive era in Canadian politics. Yet the public outpouring over the past week showed that the politics of hope and compassion still arouse Canadians, even in this conservative era. The place where Layton’s death may have the greatest impact is in Toronto municipal politics. Before he emerged on the national stage, Layton was a prominent councillor during the 1980s and 1990s. Marcus Gee of the Globe and Mail asserted that Layton’s death could make it more difficult for Mayor Rob Ford and his right-leaning allies to gut municipal services, especially ones that Layton helped to create, such as the Toronto Atmospheric Fund. A campaign has started on Facebook to change the bland name of Yonge-Dundas Square to Jack Layton Square. Even without such action, Layton’s mark on the city will remain in more subtle ways. Thousands of Canadians hold personal memories of him. “You gave me soup,” one individual wrote in chalk at Nathan Philips Square. 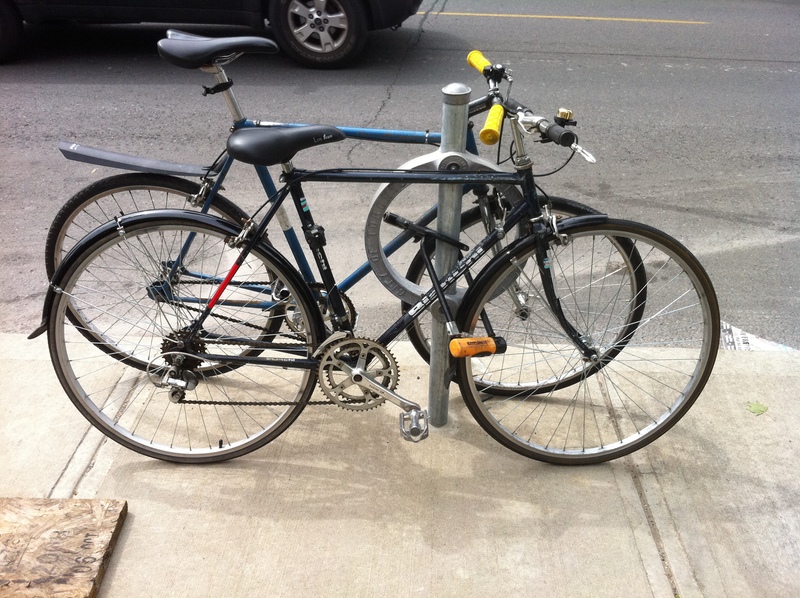 Bike locks in Toronto co-designed by Jack Layton. Photo by author. 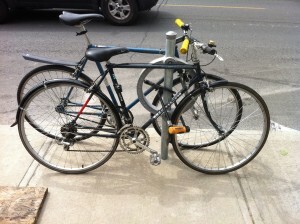 Perhaps the best symbol of Layton is the thousands of Post and Ring (or “popsicle”-style) bike locks that dot Toronto. An ardent advocate of cyclist issues during his years at City Hall, he pushed for and even helped design the locks. Artists have begun to colour abandoned, locked bikes as public art. A bike painted NDP orange and attached to one of Jack’s locks seems like one fitting way to commemorate a politician who fought to improve the everyday lives of ordinary Canadians. “You served me soup” tells a lot about the man named Jack. The picture of Jack’s locks helps to tell another part of the Jack story. And yet another person is taken from us in their prime. I hope the political circles continue his dream.